Francis of Assisi (ca. 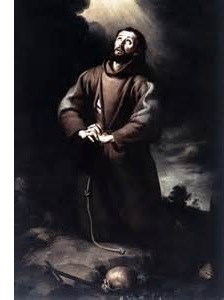 1181-1226) - Francis of Assisi is one of the most admired figures in the history of the Catholic Church. And much of that admiration can be attributed to how he chose to live his life. Born into a life of privilege, he was the son of a wealthy merchant, Pietro di Bernardone, and a noblewoman, Pica de Bourlemont (despite their status, very little is known about their lives). His birth name was actually John, but his father nicknamed him "Francessco" which means "The Frenchman" (probably because his father did a lot of business in France) and the name stuck. As a young man (around 1201), he joined Assisi's army and went to war against neighboring Perugia. At that time, Italy was not a unified country and was made up of independent city-states; and both Assisi and Perugia were two of the smaller ones in the central peninsula. He was captured and held prisoner for about a year. It's uncertain exactly when it happened, but it may have been in prison that Francis' transformation began. He was released from prison and returned to Assisi in 1203. In 1204, he suffered a serious illness which further deepened his spiritual reflection. Then in 1205, while marching to war once again, he supposedly had a vision and immediately returned home. He began to engage in more spiritual pursuits. Following a pilgrimage to Rome, be began spending more time among the poor and began to shun wealth (to the consternation of his father). Finally in 1209, he abandoned his family's wealth completely and became a mendicant (one who is dependent upon the generosity of others) and preacher (though never ordained as a priest). His earnestness began to attract a considerable following. According to tradition, he founded his Franciscan Order in 1210, which exists to this day. Franciscan friars or monks are simply disciples of St. Francis and follow his teachings. He frequently traveled overseas to preach his message; most famously as a member of the Fifth Crusade in 1219. His goal was to convert the sultan himself. He successfully gained an audience with Sultan al-Kamil, but did not convert him. Francis is considered by many to be a somewhat contradictory figure. He was known as a nature lover, and was even known to preach to animals. At the same time, he did not necessarily condemn violence and joined the Crusade as a supporter of it.